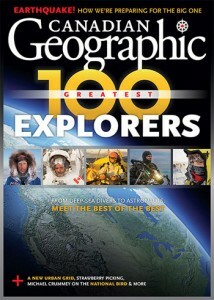 The greatest explorers today are astronauts, deep-sea divers and polar adventurers. But then they’re also paleontologists, historians, conservationists and photographers. It’s hard to find one who fits the classic “new lands” definition (think Champlain, Mackenzie, Amundsen or Shackleton), but with every new expedition, adventure, field-research breakthrough, environmental effort and invention, this living generation is questing to better our geographic and scientific knowledge of Canada, Earth and everything beyond. The beauty of the term “explorer” is that the people labelled as such are constantly helping to evolve its meaning. We can’t put many restrictions on a word that drives discovery, that constantly reframes the world, introduces us to new places, peoples and species or shows them again in ways not yet imagined. These days, it’s not often that explorers change maps. Even less common that the vehicle of discovery is a canoe. But that’s just what happened in 2012, when Adam Shoalts discovered seven previously unknown waterfalls, accidentally paddling over the edge of one in the process. This past summer, he returned to the 100-kilometer long Again River, which straddles the border between Ontario and Quebec, with funding from the Royal Canadian Geographical Society to properly document his discoveries. t’s not too often that the venerable British newspaper The Guardian reports on canoe tripping, but then again it’s equally unlikely in a world of GPS and Google Earth to paddle a wild river that’s never been properly mapped. For the past few summers, Canadian canoeist Adam Shoalts has been exploring remote Quebec waterways that have only previously been rudimentarily mapped with low-resolution aerial photographs. As The Guardian reported in July, Shoalts’ missions have been marked by surprise and adventure—including accidentally running a 15-foot (not 12-meter as the newspaper headline erroneously indicates) waterfall on the Again River in 2012. Read some of Shoalts’ past columns about wildlife and the great outdoors, focusing mostly on the wilds at his doorstep in his hometown of Pelham, Ontario.